Born in Alsace-Lorraine near the Franco-German border, on 6 August 1883, Philippe Roux (later Philip Ruh) studied with the Oblates of Mary Immaculate in Holland and joined the order there. He was sent to Ukraine to learn the language, customs and Byzantine rite. 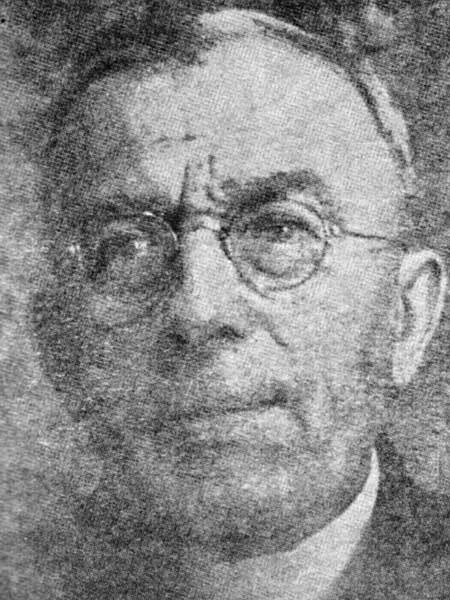 In 1913, he was posted to serve as a missionary to the Canadian Ukrainian Catholics in central Alberta. He spent 10 years in Alberta and was later transferred to Manitoba, coming to Cook’s Creek in 1930. He was parish priest there until his death in 1962. Ruh designed, altered or influenced more than 50 churches, halls, schools and other structures in Canada, on the prairies, in Ontario, Quebec, and in Michigan and Pennsylvania in the United States. In several cases he not only designed the structures, but he worked with volunteers on the site, contracted the construction and raised project funds, striving always to keep debt to a minimum. Ruh designed Ukrainian Catholic churches around Manitoba and at Kenora, Grimsby, and St. Catharines in Ontario; at Saskatoon, Regina, and Krasne in Saskatchewan; and at Edmonton, Leduc, and several mission areas in Alberta. His most well-known structures were the “Prairie Cathedral” and Grotto at Cook’s Creek. He died at Winnipeg on 24 October 1962 and was buried in the cemetery of the Ukrainian Catholic Church at Cook’s Creek. Propam’yatna knyha (Jubilee Book) 1891-1941. Yorkton, Saskatchewan (1941). Misioner i budivnychyi (Missionary and Architect) by Philip Ruh, 1960. Missionary and Architect, A Translation of the Autobiography of Reverend Philip Ruh, O.M.I., translated by Morris Kowalchuk, editor Gloria Romaniuk. Winnipeg (1984). Ukrainian Churches of Manitoba: A Building Inventory by Historic Resources, Manitoba Culture, Heritage and Recreation. Winnipeg (1987). Schematism of the Ukrainian Catholic Church a Survey of the Church in Diaspora by Dmytro Blazejowskyj. Rome (1988). Monuments to Faith by Basil Rotoff, Roman Yereniuk and Stella Hryniuk. Winnipeg (1990). Ukrainian Catholic Churches of Winnipeg Archeparchy by Anna Maria Kowcz-Baran. Winnipeg (1991). Carved in Stone by the Manitoba Genealogical Society. Winnipeg (1997). Philip Ruh fonds, Ukrainian Catholic Archeparchy of Winnipeg Archives. Gloria Romaniuk fonds, Ukrainian Catholic Archeparchy of Winnipeg Archives. Obituary, Winnipeg Free Press, 26 October 1962, page 28. We thank Reid Dickie for providing additional information used here. This page was prepared by Gordon Goldsborough and Gloria Romaniuk.